When it comes to ranking being first is the only thing that matters. Last month I had a site that has been ranked #2 for it’s main keyword move up to #1, want to see what the traffic was like? Check out the screenshot below. As you can see from the picture the site went from about 130 to 900 visitors in one day. Early the next morning, the site moved back to #2 and had 319 visitors. For this small niche, ranking #1 is about 7x better than #2! So if anyone ever tells you “The top 10 is good enough!” or “If you can get into the top 3, you’ll be OK“, those people have no real experience with being #1. So what makes the difference between a #1 and a #2 ranked site? Links, of course. 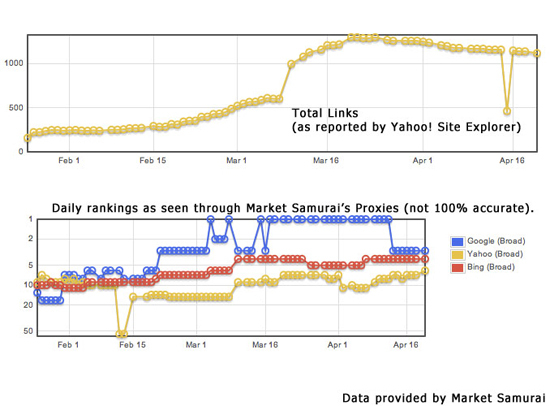 Here is another screenshot showing the increase in links paralleling an increase in rankings. As you can see, when I started working on this site around the beginning of February, the site was ranked in the top 10 and floated around for over a month. However, take a look at the total links, there was a continual and steady increase from about 150 total links to 1300 total links. Sure, you can go out and get some good directory links at Ezilon Web Directory and Best of the Web, but you need those and more! Since I’ve stopped working on this site, the links will slowly decline a little as sites go offline or certain links get moderated. Overall, to keep a #1 ranking, you want to have links consistently going up. Why Is Link Building Still a Numbers Game? Let me tell you about my competitors. One is Amazon (160,000,000 incoming links, strong domain), one is a wikipedia entry, one is a 10 year old domain with 4.4 million incoming links (my domain is 3 years old), 4 of my competitors are the creators/manufacturers of the product I’m selling. I’m their affiliate, but I’m ahead of them! So what makes the difference? Links to my target page. Here is the breakdown of the SERP’s and incoming links to the page. See a pattern? The number one site has the most links, crazy to think that Google is telling us that it’s all about page load time and relevancy isn’t it. Looking at those stats, what do you think impacts SERP’s the most? Brandon Hopkins works with companies around the world to provide website design and IT consulting services. You can contact him at his Fresno web design company. Many people think that getting to page 1 is the cure all for their traffic needs. I got a site to position 6 for a one word search that Google reports over 600k a month for. The site got no more than 10 clicks a day. Hardly impressive for the cost of the campaign but still good results for only six months of work. Terry – It seems now you have to be in the top three to get the traffic. Niche’s and long tail seem to work best for organic searches. I see this trend a ton in the niches I’m competing for and it just seems so black and white. I’m sure Google factors in other things, but by far the pattern I see is the number of backlinks. Great article Brandon. Have to say that is an amazing difference in traffic between #1 & #2. Hope you get back to the top spot! Good websites usually have good content (of some sort) that people *naturally* link to. And so it’s easy to see why google factors links so heavily. Essentially Google is mimicking ‘word of mouth’ off-line advertising/marketing. Link building is a numbers game but that is only part of the story I guess because I’ve seen sites with a couple of 100 backlinks outrank sites with 10.000’s of backlinks. Quality of backlinks, content and activity are also major factors. But nice to see those stats for pointing out the major difference in traffic you’ll get when ranking higher in the SE’s. True, Charles, although any number of quality links can be subtituted by masses of lower quality links. There are websites in extremely competitive fields completely relying on forum signature and profile spam, and shockingly 200-300k of these links seems to work pretty well. @Florian – you’re right, for now. In the near future I believe G will start heavily devaluing bulk links from the same types of sites (comments/forums/profiles/etc). We’ll see. I’ve started focusing on maintaining a Diverse Link Profile. The Farmer update certainly favors high quality content and high quality links. I think the future of link building will be quality verses quantity. More quality and relevant links is the key. Anyone who wants to succeed online with their site should strive hard and work really hard in order reach their goal. I know that it’s a continuous learning of the ins and outs of seo and you should be patient enough to actually compete with others. No doubt that links is what matters the most. But the perfect seo strategy also need some decent content to link to. Nice to see those stats for pointing out the major difference in traffic you’ll get when ranking higher in the SE’s. Good websites usually have good content. But it seems now that you have to be in the top three to get the traffic. Like many others I also believe that unique content is the key to get huge traffic and high page rank.Your article is very informative and useful.Great job man.Keep it on.Thanks. After Google Panda update is this still valid now? Unique content is still the best. I have had similar experiences with my keywords as well. Being #1 is where the traffic is. Even in big niches like mine, the difference of traffic crazy. I think I red somewhere that 1st position gets more than 40% or so of the traffic for the keyword. Awesome advice, thank you! I’ll revise the article appropriately. Proof positive that you CAN learn something new everyday! 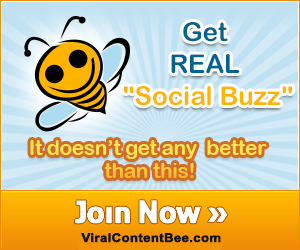 I have around 100 links but the top of the keyword I want to be listed on has 10,000! 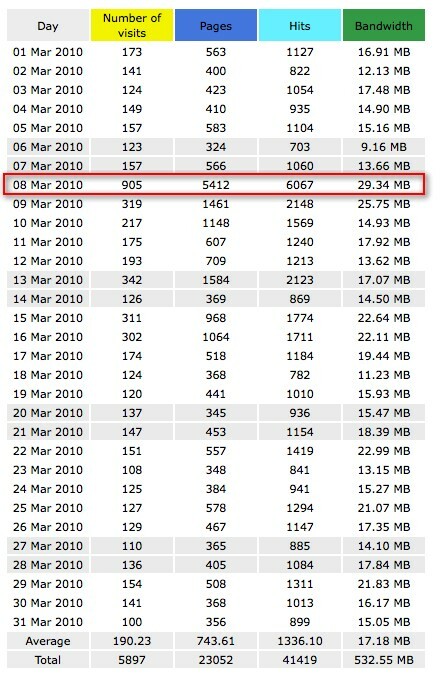 it must have took them for ever to get that many so I really do wonder how people have managed, link farms maybe? Link building really plays a key role in ranking your page through generating traffic. It is very easy to create backlinks and add visitors to your site. You can write articles, guest posts, comment and integrate social media to your blogs to increase visibility to your viewers. You have to optimize your site so that your viewers find it interesting. Things have certainly changed in the last couple of years. It used to be much easier to rank well. There are more factor being evaluated by Google now. 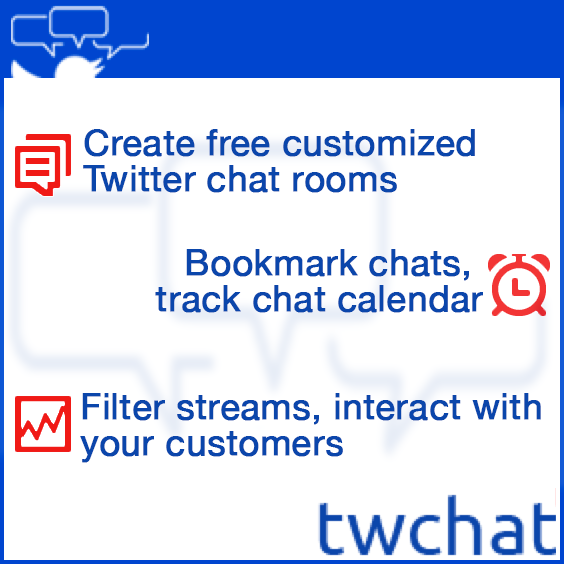 Social signals matter more than ever. Quality link building has replaced massive link building for sure! Yeap,I agree to the fact that link building gives impact to the ranking of keywords but the link from good websites are fruitful. Back links will be one of the main factors for ranking for a long time. The only difference between 2013 link building and the past is that in the past low quality links did not hut you as long as you has enough quality links your site would rank high. Now you have to be very careful about type of links you building, but it is still all about links. 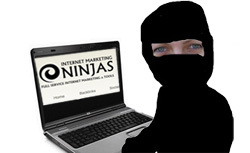 As I greatly believe the construct of valuable link, it’s still a reality that numbers counts plenty in link building. It’s sure that a page gets rank mainly because of the digits that stimulates the expansion of its value. Yep. I mean, assuming the links are of good quality and come from relevant sites, the more the merrier! Going after large numbers of links is a quantity over quality mindset carried over from the days of link building past when measuring backlinks through volume was an easy way to measure progress. Before the Panda and Penguin updates of Spring 2012, large volume link acquisition was still a somewhat effective strategy. Definately the more the better but also the factor of DA and PA is necessary to be verified…. IMO competition, number of links and quality of links everything matters. It really isn’t a numbers game after a certain point. Quality over quantity, always. Guys always remember number 1 rule for link building. I like the way you explain in the articles…. !